Remember my posts about beauty boxes? 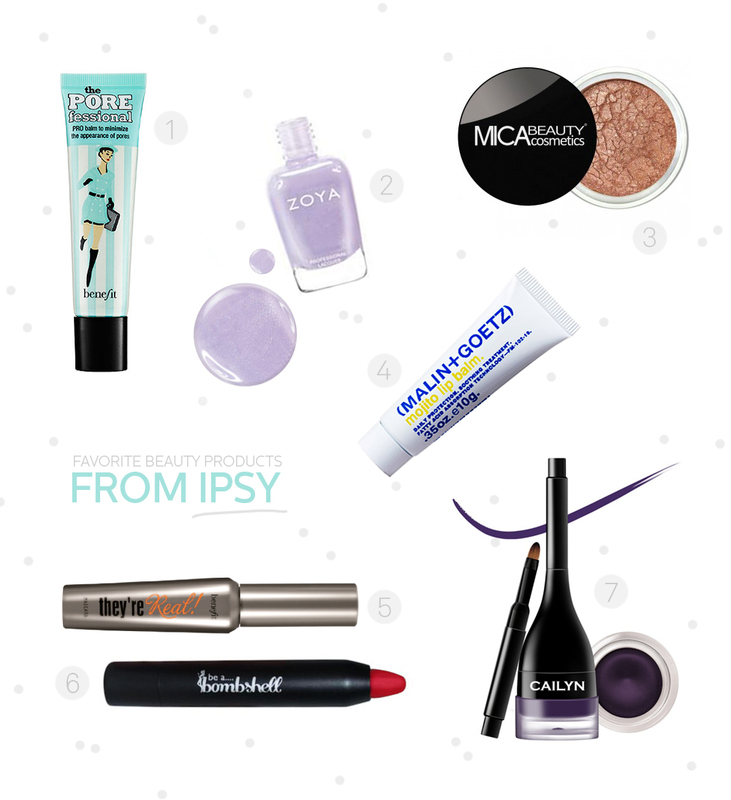 After being suscribed to Topbox for about 6 months, I decided to try another company I’ve been referred to by a friend; Ipsy. Very similar to all of those beauty box company, delivering beauty products samples to you each month, Ipsy has something more; it’s packaged in a different oh-so-pretty glam bag every time. It costs 16$/bag (shipped to you door) but I can guarantee the products are worth the price! I’ve been more than pleased with every bag so far and I can’t get myself to unsubscribing, even if my drawers are loader with cosmetics. It’s insane! It’s been 7 or 8 months since I received my first glam bag and I wanted to share some of my very favorite products so far! One word? magical! This awesome product is a pre-foundation balm made to minimize the appearance of pores. The texture is insanely soft and it works like magic on skin! You definitely have to try this. Believe me, I’ve tried MANY brands of nailpolishes but this one has reached #1 in my heart! Easy to apply, no lumps or bumps and lasts about a week without chipping. I’ve received two shades so far but this soft lilac is my very favorite! It’s sold as an eye shadow but I use it as a soft glow on my upper cheeks. Simply love the shimmer! I’m not a huge fan of lip balms, but this one leaves my lips feeling so hydrated! Gotta thank Ipsy for this! Remeber my post about my favorite mascaras? Well, let’s just add this one. It’s not on the cheap side but certainly worth it! Bright red lipstick is a girl-must-have. This crayon makes it easy to apply, easy to carry, and the smooth texture is fun to wear. I don’t think I will ever get bored of wearing this hot damn shade! I always wear black eyeliner so when I first unpacked this purple gel eyeliner with a built-in brush, I have to admit I was unsure. Now i’m just obsessed with how good my eyes look with it! Definitely my #1 eyeliner up-to-date. Notify me of followup comments via e-mail. You can also <a href='http://coloursandbeyond.com/comment-subscriptions?srp=4743&srk=&sra=s&srsrc=f'>subscribe</a> without commenting.